As a boy growing up as a military dependent overseas in Japan I was out of luck in terms of early job opportunities. All the "good jobs" took years of waiting... hoping that the more senior kids families would get "shipped out" so I might secure a coveted box-boy position at the PX... Ah, but I was fortunate to secure employment in my early teens working in the pet-fish industry. Folks always seem to be impressed when I relate my first jobs... um, they were cleaning fish tanks, lugging water about and germinal to this story, washing Betta bowls, preparing foods for Bettas, washing Betta bowls, feeding Bettas, washing Betta bowls... and did I mention washing Betta bowls? Back in the states in the late sixties I was fortunate to gain employment in retail fish stores (with very few Bettas, and Betta tanks instead of bowls! Still washed them though), and try my hand at Betta breeding. Of all fish species, the Siamese Fighting Fish's reproduction must be one of the most widely observed, and easily manipulated. Soon I was raising my little males (and yes, washing Betta jars of every conceivable size and type). Skip ahead a few decades, almost all the while working in all aspects of the ornamental aquatics trade... and I'm still a Betta fancier. Southeast Asia, Malaysia, Thailand. Introduced elsewhere. To about three inches, longer accounting for flowing unpaired fins. Females much shorter, maybe an inch and a half. Many sport mutations (about 13 colors, multiple tail configurations). Bettas (which we'll use as a generic term for "the" Betta, B. splendens, though this genus contains several other species) are Labyrinth Fishes, members of the Suborder Anabantoidei. Along with the Gouramis, Climbing Perches, Paradisefishes and more they possess an auxiliary breathing apparatus (the labyrinth) that aids them in aerial respiration (it's said that Bettas may drown if kept underwater, not allowed to take periodic gulps of air from the surface). 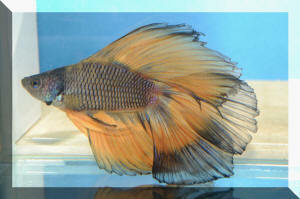 Betta splendens Regan 1910, the Siamese Fighting Fish. A perennial favorite of aquarists, needing only clean, warm water (not cold! ), an occasional meaty feeding (not just dried! ), and no mean tank-mates. Originally found in just Thailand and Cambodia. Males to about four inches in length, females to half that. Many sport mutations. Live for about two years. Males at right, female below. 1) Source. The male Bettas offered in retail outlets are generally fine... until you become exposed to the more carefully selectively bred, reared and cared for ones from private breeders. If you want to be "happy" don't look beyond retailers tanks here. The inexpensive ones there are beautiful, typically hardy... Should you delve into what more the hobbyist, specialty breeder's have to offer, you may well get hooked, becoming a Betta fanatic! You've been warned. 2) Apparent Health: Easier to determine with these fish than most others. Alertness, and openness of finnage are extremely important. Don't buy a "sulking", clamped fin Betta. Look closely at the fins and skin of potential purchases. Often the twin scourges of external parasites velvet (oodiniumiasis) and/or ich (ichthyophthiriaisis) can be seen on infested Bettas. If any males display these ectoparasites, buy NONE of them. Small tears in large fins are no real problem, and generally repair quickly of their own accord. However, evidence of rotting negates acquisition. 3) Size/Age: Take care to not pick out "the biggest" individuals. Bettas are not long-live animals, most perishing within two years of birth... and being offered for sale at a few to several months of age. Though displayed in simple to novel bowls, and celebratedly tolerant of up to appalling, deteriorating water conditions, Bettas are best kept as other tropical fishes. 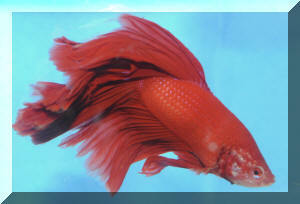 BETTA'S ARE TROPICAL FISHES.... LIKELY MOST DIE DIRECTLY AND INDIRECTLY FROM THE ILL-EFFECTS OF CHILLING. In an aquarium, with purposeful filtration, steady heating, and regular maintenance. Yes, Bettas can be kept in bowls... but these should be large, not-filled to the top (to prevent jumping out), kept in warm, stable circumstances, and cleaned regularly, at least every two weeks. One chief cause of their loss is "chilling". Bettas are tropical fishes that live in waters of about the mid seventies to mid eighties Fahrenheit in temperature. I wish the folks who make, promote the use of jars or worse, the containers that hang on walls could be made to experience the thermal changes that Bettas face there. 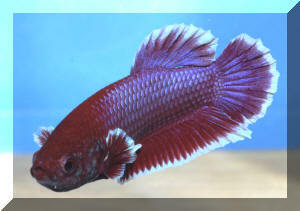 An ideal Betta set-up includes live plants, warm water (low eighties F), not much surface disruption (no splashing hang on the tank filters or above water canister filter discharges), a tight-fitting cover to prevent jumping... (probably the third most common cause after starvation, and chilling) and cool-air drafts. of moderate hardness and neutral to slightly acidic pH (the last two are not extremely important to keepers who have well-acclimated specimens). 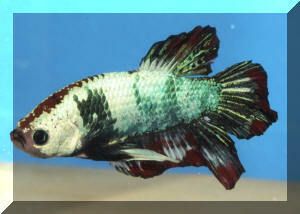 Betta splendens derives its common name for the long-standing practice of people in Thailand using it in competitive bouts bet on by mainly men. These "fights" are often staged in bars, other social settings with two short finned (fighters aren't bred for beauty) Bettas placed contiguously with a panel placed between them that is later removed, allowing the combatants to engage in a semi-ritualistic battle of fin biting and tearing. Combatants are rarely killed outright, and a referee/bookie judges when one has "lost", the other declared the winner. It is said that in times past, some wagers included bettors wives, children, even themselves into servitude! Females are sometimes kept by hobbyists together in a tank. This generally works out. Permanently housing females with a male I don't suggest. As much too often the male will chase into cover, otherwise harass the females to the point of poor health. Most male Bettas (yes, there is some variability) are "medium aggressive" freshwater fishes... getting along well for example with Angels, the smaller Gouramis, livebearers like Swords, Mollies, Platies (though eating the latter groups young with gusto). Slower-moving fishes with long-flowing fins like male show guppies are out, as are fast-moving nippers like many of the medium sized barbs (Tigers, Rosies, though Checkerboards, Golds, Cherries are often okay), bigger Danios... for two reasons. The possibility of persistent taunting of the Betta and their ability to quickly consume all its food. Of course, sequestering the Betta within a container in the tank away from tankmates opens up all possibilities. Here I will offer the briefest of outlines: This Betta is a bubblenest builder. Males build/blow a nest of bubbles anchored to a floating item. Females are enticed, squeezed of their eggs, which are fertilized, collected and spat into the floating mass. Males chase away females, guard this nest with the eggs hatching in 24-36 hours depending on temperature, free-swimming in 5 days or so. Young accept very fine foods, best are small live foods, " infusoria", with larger choices like live baby brine shrimp being offered with growth. A few important points. It's important to keep drafts to an absolute minimum. Cold air will kill young very quickly. Do start your "infusoria" cultures early and often. 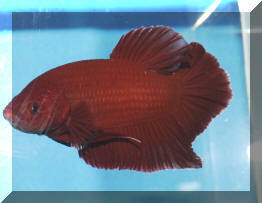 Some "go bad", and many young Bettas can consume a surprisingly large amount of food. 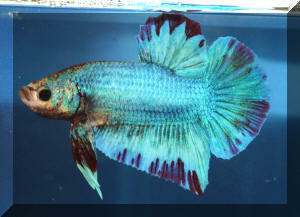 Amongst the most common causes of Betta loss are a lack of nutrition. Though there are a few "standard" pelleted "Betta foods" offered on the market, many Bettas refuse them, at least initially, when unfamiliar. It is best, better in my estimation, to offer at least some live or frozen/defrosted meaty food daily. The list is long with small worms (like tubificids, grindal, white...), crustaceans (like brine shrimp, daphnia) and insect larvae (like bloodworms) being regularly available. Take care to schedule such feedings to allow for the "other fishes" to be drawn away (lest they eat all your Bettas food) if present, ideally offering the food in about the same place, about the same time daily. I've mentioned the three most common infectious and parasitic diseases of Bettas: Fin rot, velvet and ich. They are of course best dealt with by prevention and good maintenance practices (all occurrences are linked to introduction, chilling, and/or poor water quality), but can be treated with simple remedies. Some writers, organizations endorse the use of aquarium salt, acriflavine, others malachite green as remedies. The Betta breeder I worked for in Japan years back utilized a drop of dilute malachite in the new water of all "just cleaned" Betta bowls (yes, my hands were perennially bluish). 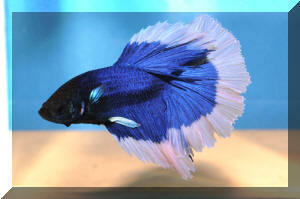 The Betta we know as the Siamese Fighting Fish is a true gift of nature to aquarists. Amongst the most beautiful of aquatic animals, extremely tolerant of widely ranging water conditions, undemanding as a wet-pet... All it/they demand is an occasional "bowl/tank scrubbing", something meaty in the way of foods, and a lack of aggressive, fin-nipping tankmates. 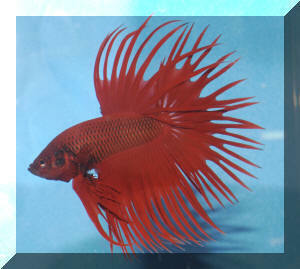 If so self-incited, do consider trying your hand at breeding, rearing Betta splendens. A delightful, wondrous and tremendous learning experience. Bender, Nat. 1992. Healthy fish mean Betta sales in your store. Pet Dealer 12/92. Bertholdt, Walter. 1953. Breeding the Fighting Fish. TFH 2:2/53. Castro, Alfred D. 2001. A look at the Anabantoids. A new series on these versatile fishes. AFM 1//01. Cypher, Ronald L. & Patrick C. McCarthy. 1976. A new approach to the old problem of fish classification: Electrophoretic studies of Betta. TFH 7/76. Falcione, Peter. 1990. Setting up a Betta corner. 1/90. Gordon, Myron. 1953. 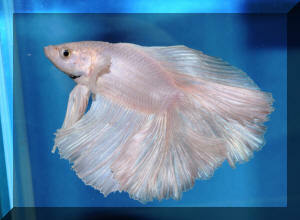 The legendary Albino Fighting Fish. TFH 2:2/53. Lewis, Linda. 1998. Coming up for air- the Labyrinth Fishes. AFM 12/98. Linke, Horst. 1991. Labyrinth Fish- The Bubble-Nest Builders. Tetra-Press, Melle Germany. 174pp. Lucas, Gene A. 1980. On the history of Bettas. FAMA 9/80. Lucas, Gene A. 1986. The literature of Bettas: books and monographs. FAMA 1/86. Maurus, Walt. 1978. Bettas, a truly splendid fish. FAMA 1/78. Maurus, Walt. 1986. Reminiscing about the future. FAMA 3/86. Ostermoeller, Wolfgang. 1972. Peaceful coexistence among Siamese Fighting Fishes. Aquarium Digest International 1(2)/72. Pinter, Helmut. 1984. Labyrinth Fish. A Comprehensive Guide to the Care and Breeding of Exotic Tropical Fish. Barrons, NY, London, Toronto, Sydney. 144pp. Saunders, Steve. 1988. The Betta revealed. 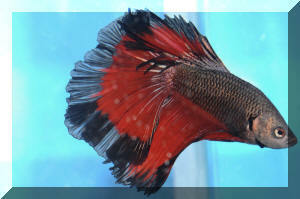 Bettas come in a rainbow of colors, are easy to care for and require very little space. AFM 12/88.